The binary on the website is capable only to decode encrypted data, not encode, and may contain trojan (seems like it doesn't, but don't believe me). The binary is signed with the valid (usual) key. All old versions are wiped, the repository is wiped too. Assumption #1 The website is presumed hacked, the keys are presumed compromised. Please do not download or run it. And please don't switch to bitlocker. On the SourceForge, the keys were changed before any TrueCrypt files uploaded, but now they are deleted and the old keys got reverted back. Why I think so: strange key change, why bitlocker? Why I think so: all files are with valid signatures, all the releases are available (Windows; Linux x86, x86_64, console versions, Mac OS, sources), the binaries seems like was built on the usual developer PC (there are some paths like c:\truecrypt-7.2\driver\obj_driver_release\i386\truecrypt.pdb, which were the same for 7.1a). License text is changed too (see the diff below). Assumption #2 is more likely true than assumption #1. Sad but true. Assumption #3 7.1a is backdoored and the developer wants all users to stop using it. Why I think so: there is a website http://truecryptcheck.wordpress.com which contains all the hash sums for TrueCrypt 7.1a. Is has only 1 blog record from August 15, 2013, only for TrueCrypt and only for 7.1a. It's a bit strange to make a website with the hash sums for only one program and only one version of it. April 12, 2014: Site is set to read-only mode. All the user accounts are deleted. Thanks everybody for participating in the project! SourceForge sent emails on 22 May, they said they changed password algorithms and everybody should change their passwords. 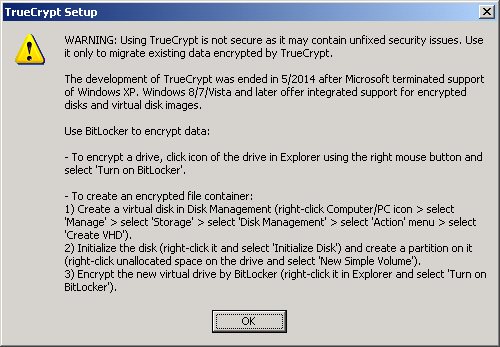 We have had no contact with the TrueCrypt project team (and thus no complaints). We see no indicator of account compromise; current usage is consistent with past usage. TrueCrypt developers are unknown and currently there is no way to know who is who and who should we listen to. (3/4) the new executable contains the same message and is cryptographically signed. We believe that there is either a power conflict..
You may join IRC #truecrypt@irc.freenode.net, although there is no OPs right now. How is this different? It's the same. This URL has been excluded from the Wayback Machine."